Maybe you also come across above trouble. A large MOV file usually takes much space of our computer or portable devices like iPhone, iPod, PSP, etc. It even curbs us to send to our friends or share on the internet. Want to compress MOV file to smaller size? Don’t know how to compress MOV files? 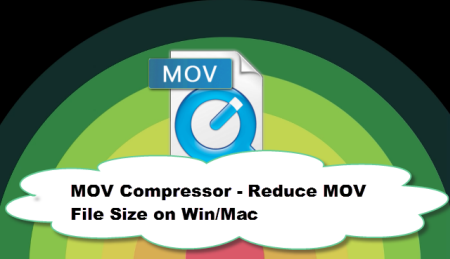 Have been seeking a MOV Compressor for Mac or Windows to reduce MOV file size? If you are a MOV user, you may encounter the situations mentioned above. The following paragraphs will show you ways and tips to compress MOV(Quicktime) on Mac/Win (Windows 10 included) quickly and easily. Click “Format” to find “HD Video” catalogue, select “MPEG-4 HD Video (*.mp4)” or “H.264 HD Video(*.mp4)” as the best video formats. Click Edit button, you can realize editing MOV videos like trim video, crop video, rotate video; add subtitles/effects/watermark and more. Change Parameter Settings, Incl. Video Resolution, Frame Rate and Bit Rate. Click “Setting” button of the program and a window will pop up. From Size(pix) drop-down list, select an appropriate parameter or enter a desire value for output file. Or choose lower value from the drop-down list of the right side of “Bitrate” to decrease MOV Bitrate in order to resize your MOV. When all these settings are ready, you can click the “Convert” button to begin the compress MOVon Windows conversion. When the ripping is done, you can click on “Open” button to locate the ripped videos.